These are panoramic photographs of Kansas towns beginning with Caldwell and ending with Everest. The Kansas Film Commission created the photos to promote Kansas locations to film companies. Many of the photographs show business districts and buildings. The panoramics were created by taking individual photos and taping them together. 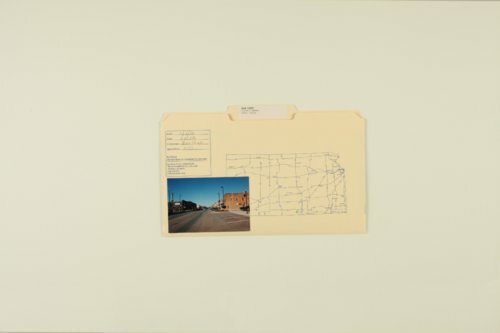 Towns and cities included in this part of the collection are: Caldwell, Caney, Carbondale, Cassoday, Cedar Bluffs, Cedar Vale, Centropolis, Chanute, Chase, Chautauqua, Chetopa, Circleville, Clay Center, Clayton, Climax, Clinton, Clyde, Codell, Coffeyville, Colby, Coldwater, Collyer, Colony, Columbus, Concordia, Corona, Courtland, Cuba, Damar, Deering (Dearing), Delavan, Delia, Denison, Denmark, Denton, Derby, De Soto, Dorrance, Dover, Dresden, Dunlap, Durham, Dwight, Easton, Edson, Elk City, Elk Falls, Elkhart, Ellinwood, Ellsworth, Elmdale, Emporia, Ensign, Eudora, and Everest. There are interiors of the Brown Grand Theatre in the Concordia folder. The theatre was listed on the National Register of Historic Places in 1973.